Step 1 In the smallest bowl of your food processor, blend all ingredients and stick in the fridge to chill while you make the seafood balls. Step 2 In the largest bowl of your food processor, add all the ingredients (except the breading ingredients) and mix until everything has turned into a fine paste. Step 3 Heat a non-stick or cast iron saute pan with a few tablespoons of fat over medium-high heat. Step 4 In one soup bowl, mix together the egg and water. In another soup bowl, toss together the almond flour and salt. Scoop the seafood mixture into small balls. 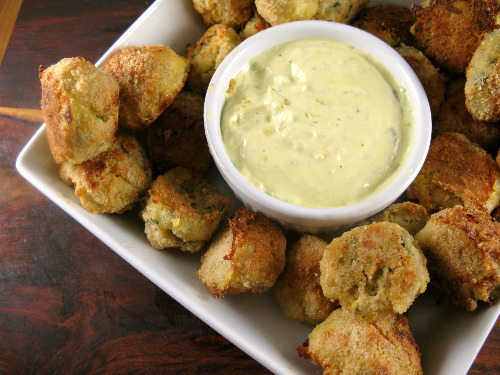 Drop and roll the seafood balls in the almond flour mixture, the egg mixture then in the almond flour again. Step 5 In batches, place the seafood balls in the saute pan and saute, until the balls are brown and crispy on all sides–about 3-4 minutes on each side. A kid-friendly riff on fish sticks. We made tartar sauce from scratch, I highly recommend you do the same. If you’re deathly afraid (which you shouldn’t be) of making mayo, substitute the homemade mayo for store bought, but DO NOT, I repeat, DO NOT, buy store bought tartar sauce. It’s so gross…so, so gross. These seafood balls are cheap, cheap, cheap. I swear they could pass for crab cakes. We used cod (a cheap, easy to find, flaky, white fish that tastes way better than tilapia) and shrimp. Another nod to cod: you can find it wild-caught! Feel free to play around with the ratio of cod-to-shrimp, but do keep the total weight around 2 pounds.